LEDs are the latest in lighting technology and represent a substantial leap in long term, durable, efficient lighting. At their core ,LEDs function completely different than incandescent and fluorescent lighting. It's semiconductor construction makes it very robust against damage. No fragile glass or filaments to break or burn out and no toxic chemicals to contaminate your space. 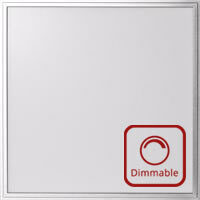 Lightweight and only 1/2" thick, LED panels offer many advantages over traditional lighting. Available in 2x2 or 2x4 panels, take your lighting into the future with our high efficiency LED lighting panels. UL listed drivers. uDecor LED light panels deliver a soft even light, free from flickering or pulsing that is common with many fluorescent lights. The polycarbonate diffuser distributes the light evenly, creating soft shadows that are much more pleasing in the home or work environment. No more strobing or buzzing from failing fluorescent bulbs and ballasts. Fluorescent light bulbs contain mercury sealed within the glass tubing. When a fluorescent bulb breaks some of this mercury is released as mercury vapor. Because of this, many states now require that all fluorescent bulbs be taken to approved collection agencies. LED lights have no toxic or dangerous chemicals in them. With a projected lifespan of 50,000 hours, LED lighting outshines the competition in terms of longevity. This reduces your replacement cost approximately 50x that of a standard incandescent lamp.